We are open from 9 to 12 and 14 to 18, from Monday to Saturday. By appointment on Sunday and public holiday (a call or an Email). 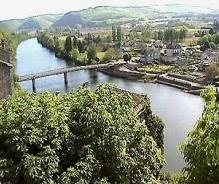 Cahors is situated on the river Lot just to the south of the Dordogne in South-West France. Look on the map to the north of the Bordeaux Toulouse motorway and to the west of the N20. The Cahors Apellation extends over 4000 hectares, from the town of Cahors at its eastern edge to the limit of the department of the Lot near the town of Fumel in the west. Chateau Latuc is situated approximately 1 km from the village of Mauroux on the western border of the appellation and about 40kms from Cahors, 45 kms north of Agen. From Cahors take the D911, direction Villeneuve sur Lot. At Puy L'Eveque (30kms) cross the river Lot following the D5 towards Tournon and Mauroux. Pass through the village of Lacapelle Cabanac and after 1 km take the road to the right and follow the signs to Chateau Latuc. From Agen take the D656 towards Cahors. At Tournon d'Agenais (40kms) take the road towards Cahors but almost immediately take the first turn left towards Mauroux. Pass through the village of Mauroux and follow the signs to Chateau Latuc at the second roundabout.